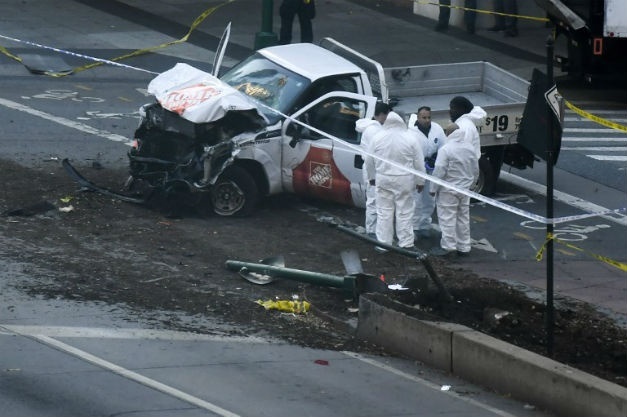 A driver plowed a pickup truck down a crowded bike path along the Hudson River in Manhattan on Tuesday, killing eight people and injuring 11. He was, however, shot by a police officer in what officials are calling the deadliest terrorist attack on New York City since September 11, 2001. The rampage ended when the motorist — whom the police identified as Sayfullo Saipov, 29 — smashed into a school bus, jumped out of his truck and ran up and down the highway waving a pellet gun and paintball gun and shouting "Allahu akbar," - Arabic for "God is great," before he was shot in the abdomen by the officer. He remained in critical condition on Tuesday evening. Mayor Bill de Blasio declared the rampage a terrorist attack and federal law enforcement authorities were leading the investigation. Investigators discovered handwritten notes in Arabic near the truck that indicated allegiance to the Islamic State, two law enforcement officials said. But investigators had not uncovered evidence of any direct or enabling ties between Mr Saipov and ISIS and were treating the episode as a case of an "inspired" attacker, 2 counter-terrorism officials said. Five of the people killed were Argentine tourists who traveled to New York for a 30-year high school reunion celebration, said a senior official in Santa Fe Province, where they were from.